What to do or say, and Thanks to all who did. So it’s happened to your friend, co-worker, family member, neighbour, or just someone you know and care about. A tragedy of some kind, maybe a cancer diagnosis like ours. Now you want to know what to do. What to say. Do you bring it up? Or do you say nothing, giving the person their privacy? What is “the right thing” to say? How can you help them without causing them to have to relive the sadness? Especially when there is nothing you can do or say to fix it, to make it go away and make life go back to how it used to be? There is no perfect answer, no “special statement” you can make that will be just right. The person you care about is not expecting you to come up the right thing to do or say, for the simple reason that they are also in unfamiliar territory. They don’t know how to act either. They don’t know if they want to talk about it or not, they don’t know how to behave, they’ve never done this before either! Of course I can’t answer for everyone. But I can tell you what helped me. The most important thing, no matter what, is, don’t abandon the person. By that I mean, don’t pretend “it”, whatever it is, hasn’t happened. Don’t assume if they need help they will ask for it. Don’t think that they would rather just act normal. Normal doesn’t exist anymore. One of my co-workers came up to me on my first day back at work after Elliot was diagnosed. Everyone knew of course, my workplace is one of these places where everyone knows everything about everyone. The joke in our workplace is that your coworkers would all know about your imminent divorce before you do. And that’s all that was needed. I felt, just for a moment, less alone. My family, friends, and coworkers have truly amazed me during this. So yes, here comes the mushy part, where I tearfully thank everyone for all they have done for me (I am picturing myself in a designer evening gown at a microphone, clinging to an Oscar as I make my thank you speech). To my mom, who has also been battling cancer for twelve years, and who dropped everything and flew 4000 miles to be here and help out. Three times, within 10 months. To my dad, who is always the first to read and email me about a post I’ve written on the blog updating people about Elliot, despite a 6 hour time difference. (Does he have some kind of alarm that wakes him if I post something, so he can be first?) He also has made the long trip here twice recently, to be here for important moments. To my big sister, who carefully plans and saves up for her dream trips, then blows all her savings on flights to Switzerland. Over and over. And then says it’s fine because she needed more chocolate anyway. To my little sister, who is the most patient playmate Elliot could have. To the rest of my family, my brothers, my cousins, aunts and uncles, my parents’ friends and everyone who keeps sending me messages and letters of support, little gifts and cards for Elliot, messages on my blog. You have gone out of your way to show me you care, and I hope you know what it has meant. To Martin’s sister, who flew down right away for a weekend, to support her brother through the initial shock. It was her first time in years (or ever?) with a whole weekend away from her three young kids, and she spent the entire time… playing with our 4 year old. One who sends me a message every single time I’m at the hospital to check on me (I’m not even sure how she does this, we’ve been to the hospital over 100 times by my calculations). One who sends me uplifting, caring messages on a regular basis despite having gone through her own personal tragedy recently, and is always available for coffee and a chat. One who lives in Canada and felt helpless to know what to do, so started sending me funny random emails about her daily life on a regular basis on the theory that it would distract me (the suitcase-shaped wedding cake was a classic). 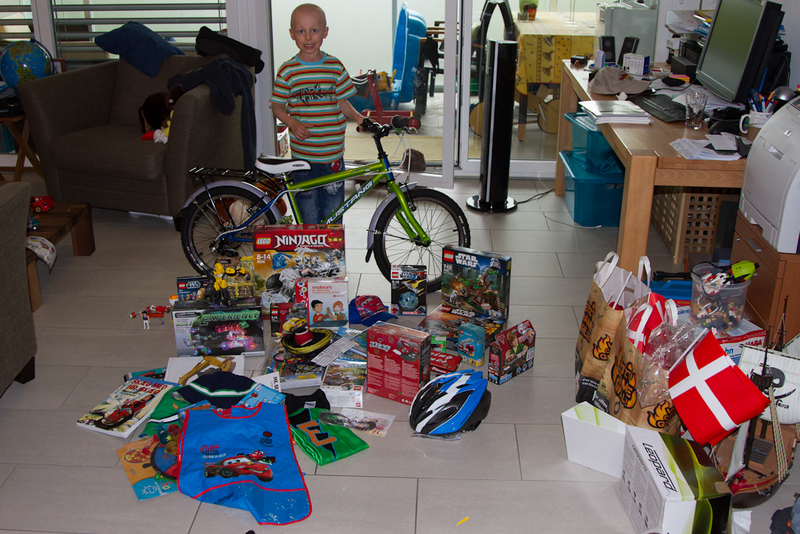 To my girlfriends here who bought Elliot an end-of-chemo gift he’ll never forget: a big-boy bike. And then surprised me with a fabulous gift certificate to a spa. To all our family and friends who came to Elliot’s end-of-chemo party, some travelling quite far to be there, some wearing very special t-shirts! And those who wanted to be there but couldn’t make it. It was a magical day for him. To ARFEC (Association Romande des Familles d’Enfants Atteints de Cancer), who were there to support us from the first day. To Elliot’s teacher, who has magically managed to make him feel like he is still part of her class despite the fact that he has missed almost the entire year, by dropping letters, cards and little projects in our mailbox, and by teaching a class of twenty young children about cancer in a way that made them understand and relate to it without turning it into something weird and scary, so that when Elliot comes back they are ready for him. To my co worker who made sure I knew he was there if I needed to talk, anytime. To the anonymous donor who wanted to give us 5000chf when our insurance wouldn’t cover one of the chemotherapy drugs. (The money was sent to ARFEC instead, and the insurance company changed their mind after the newspaper story created an uproar of public outrage). To our pharmacist here in Rolle who has spent hours researching different medications for Elliot, trying to find the ones that “taste ok”, even to the point of making pills herself. To the father of my two older boys, for letting me keep them last year at Christmas even though that was not normally the arrangement, no questions asked. To my two older boys, who are just great. To my husband, where do I begin… Somehow we created this perfect little boy with this tragic little flaw, and despite everything, I wouldn’t have it any other way. Thanks to you Nicole. You are a true star !! Crying, just crying. You guys did it Nicole. You made it through. I’m also impatiently waiting for the scan results. Love as always! I’m moved so deeply each time I have a chance to read your blog Nicole. Again my hat goes off to you for your giving us a true reality look at what cancer really is and how you as a family have weathered it’s storm . The human spirit is amazing isn’t it? I really hope to meet your special little Elliott some day! Je vous souhaite de très belles vacances et j’espère que vous retrouvez ce qui sera normal dorénavent. – Madame, c’est quoi être injuste ? – C’est reprocher à quelqu’un quelque chose qu’il n’a pas fait. – Donc, c’est injuste de me reprocher de ne pas faire mes devoirs !